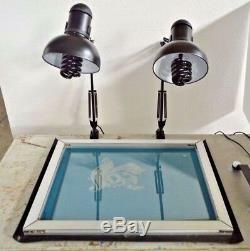 4 Color T-shirt Printing kit. Screen printing is arguably most versatile in printing, almost everything can be used as substrate. 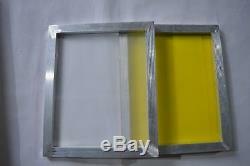 Our company provide this 4 color 4 station screen printing. Package with all stuff needed by a small screen printing workshop. We show buyers skilled operation and application by words and video, achieving integration of technique , equipment, material and service. 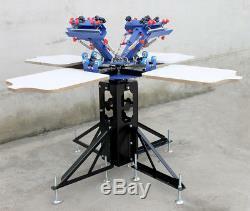 4 Color 4 Station Screen Printing Machine (006526). They can print onto clothing (especially for T-shirt), woven fabric, metal, paper, copybook, plastic, circuit board, wood, glass, ceramic tile, leather and other plane printing substrates, which is especially suitable for small businesses and individual printing shop. The frame & Pallet can Double Rotate Arbitrarily in 360 Degree. Red Handles on the printer holder are used to Adjust the Screen Printing Frame and move the printer arm right & left lightly. Table type and combination design saves place and convenient for transportation. Adjustable double-spring devices are available for screen frames of different weight. Screen clamp can be moved up and down, which is suitable for screen frame within 1.2 (3cm) thickness. Ig supporting device keeps the machine stable and in balance. All-metal construction, advanced electrostatic spraying and electroplating, durable, easy to clear and no rust. Foundation is consistent with heating box , stable, saving-space and overcoming the flaw caused by traditional. That easily gets knock and stuck. After well installed, connect the power supply and turn on the switch and then it will work automatically. With four universal wheels, easy move. Sturdy design with powder coated housing to prevent rust. With a few bolts you have a flash that's ready to be put to work. 18"x 24" (45 x 60 cm). Crate Dimension: 34"x 20"x 14(86 x 51 x 36 cm). Screen Printing Materials Kit B (006802). All the items related in the above are all well packaged into one box; item number is. 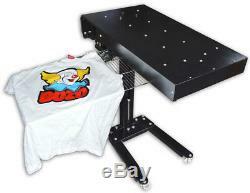 Plate washing is one of the most important processes during screen printing. Premium plate-washing tank of our company is furnished with water tank, automatic pressurizing water spray gun and screen frame clapboard, which can make plate washing cleaner and more convenient. Parameters Internal dimension: 26"X20"X15(66X50X37cm) Net Weight: 15Lb (7kg). 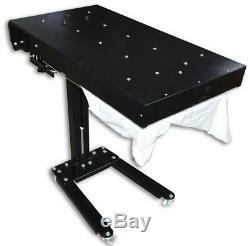 Screen plate making is one of the most important procedures for doing screen printing business. 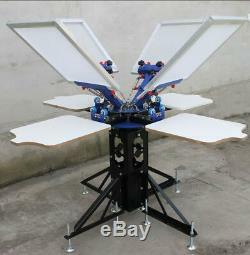 This kit is specially designed for making screen printing plate. It's easy operated, which will be your best choice! Glass & Sucker: to guarantee a better exposing effect. 1 Photosensitive Emulsion & 1. 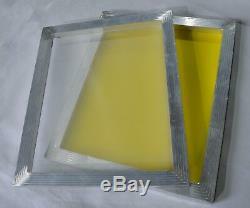 24 pcs transparency film & 100ml. Blacken printed graphics to guarantee a better exposing effect. 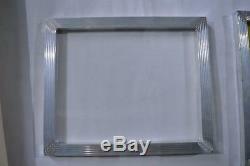 4 16"x 20" Frame with 120 mesh count & 1. Printing & After-printed Screen Processing Kit. 500g Pallet Adhesive & 1 Pallet Adhesive Scraper. 8 bottles Inks (1 White base; 2 Transparent Paste; 1 Black, 1 Green, Red, 1 Yellow, & 1 Blue Pigments). 4 Spatulas & 4 sheets Clean Up Card. 2 pc T-shirts for printing test. 200g All Mesh Prep Degreaser. 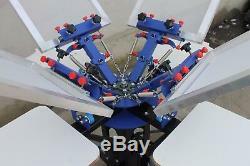 1 1 Four Color Four Station Screen Printing Machine 006526. 2 1 set of Flash Dryer (006042). 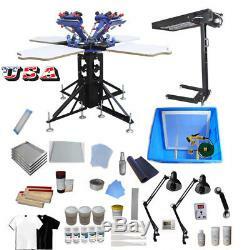 3 1 set of screen printing equipment & materials kit (006802), which includes the following items. 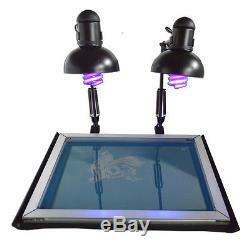 1 1 set of Washout Tank 2 1 set of UV Exposure Unit Kit: with plug, timer, glass & sucker, rubber subplate included. 3 1 set of photosensitive emulsion 4 1 pc of 14" Emulsion Scoop Coater 5 20 sheets of A4 Transparency Film 6 1 bottle of Graphics Blackening Agents 7 4 16"x20" Screen Frame with 120 Mesh Count 8 1 roll of Aluminum Foil Tape 9 1 bottle of Pallet Adhesive 10 1 pc of Pallet Adhesive Scraper 11 4 pcs of Spatulas 12 4 sheets of Clean Up Card 13 4 pcs of 13" Squeegees 14 1 bottle of Emulsion Remover Powder 15 1 bottle of Ghost Cream 16 1 bottle of All Mesh Prep Degreaser 17 2 pcs of T-shirts 18 1 bottle of White Paste - 1kg/bottle 19 2 bottles of Transparent Base - 1kg/bottle 20 1 bottle of Yellow Color Pigment - 200g/bottle 21 1 bottle of Blue Color Pigment - 200g/bottle 22 1 bottle of Green Color Pigment - 200g/bottle 23 1 bottle of Black Color Pigment - 200g/bottle 24 1 bottle of Red Color Pigment - 200g/bottle. Orders are processed from Monday-Friday; Not on the weekends & public holidays. We will work with you to get the case resolved in the fastest method. Please contact with us at first for more details. If product was received damaged or not as described, please send us some pictures or videos, so we could well understand your problem, then solve them for you ASAP. Besides, it's much helpful for us to claim with UPS, remind our related department to pay much more attention to packaging later on. If an item is received damaged, customer service must be contacted within 7 days of receiving your item. ECheck Issues: Payments via eCheck do not clear immediately. Usually you will wait 5-7 days after checkout for it to clear. The item "4 Color 4 Station Screen Printing Kit Flash Dryer Exposure Unit Shirt Printer" is in sale since Thursday, October 6, 2016. This item is in the category "Business & Industrial\Printing & Graphic Arts\Screen & Specialty Printing\Screen Printing". The seller is "artdidinc" and is located in Rancho Cucamonga, California.